Two by Two is an exciting children literature project. Its purpose is to bring more or less known children books in the attention of teachers, parents and children around the world, paired on specific themes such as death, communication, self esteem, anger management, friendship or unconditional love. A lot of these books were brought to my attention by a very dear friend, with whom I share the passion for child literature. Almost all of these books are in my personal library, carefully chosen to fulfill some of the criteria described here, and have been used during my teaching classes. The children I work with had wonderful reactions to them, and this has inspired me to write this Two by Two series. Maria Montessori was a remarkably bright girl who grew up to shake the foundations of the traditional education system. Although her method is becoming increasingly popular (you can read a detailed article about it here), there still are many less known facts about her life. She grew up in a period when women were not allowed to vote or to make decisions for themselves. She was one of the first Italian girls to be allowed public education. She challenged the norms by deciding to take technical studies, then switched to medicine. She was sensitive but strong willed and liked to do things her way. She was a fast learner and quickly adopted good case practices from around the world and took on the challenge to work with very disadvantaged children. 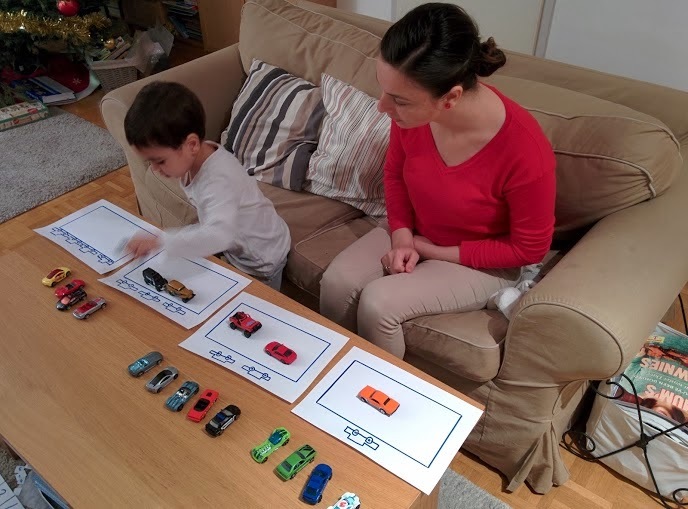 She then grasped the first opportunity to work with normal children and by observing them and their needs, she designed materials and activities that could help them grow happy and independent. 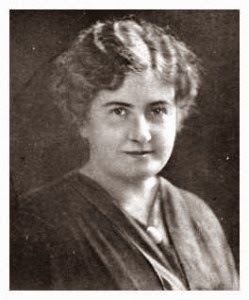 She lectured in countries around the world and assisted in the opening of many Montessori schools. She refused Mussolini when he demanded fascism to be taught in her schools and relocated several times. She met Gandhi, Nehru and Tagore. She received three nominations for the Nobel Peace Prize. 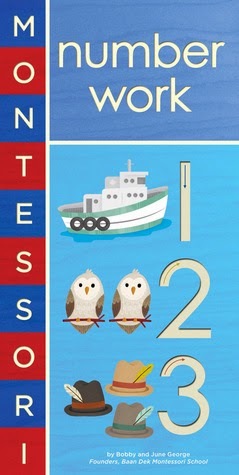 These are some of the reasons why I chose this first article of 2014 from the Two by Two series to cover two Montessori inspired books! Although the third in a series of books created by the same authors, I believe it should be the first to be introduced to children, as they encounter shapes in their environment much earlier than they recognize and understand the numbers or the letters. 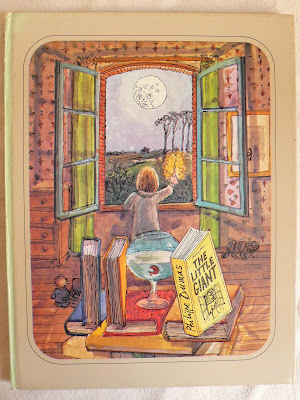 Unlike other books presented in the Two by Two series, this one does not stand out because of stunning illustrations. 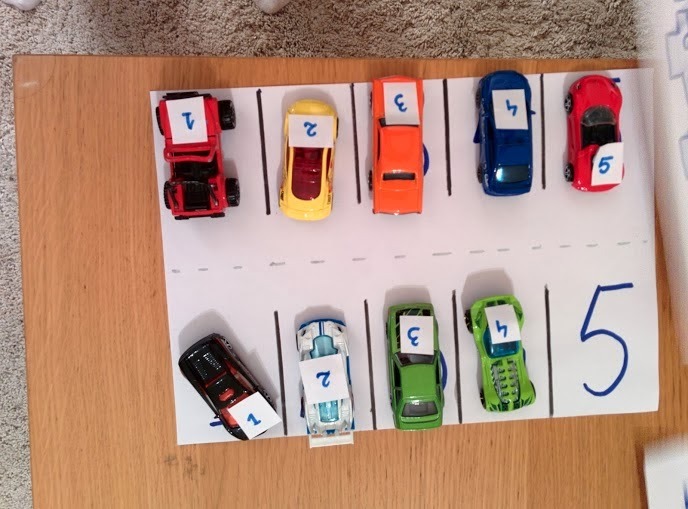 As Montessori advocated for children to be grounded in reality at early ages, the pictures show colorful real-life objects which can help children spot the shapes in their own environment or outside of it. Throughout the book, shapes are introduced three by three, from three different types of triangles (isosceles, equilateral, right-angled); to three different types of rounds (circle, ellipse, oval); to three different types of parallelograms (square, rectangle, rhombus); and three different types of polygons (pentagon, hexagon, octagon). 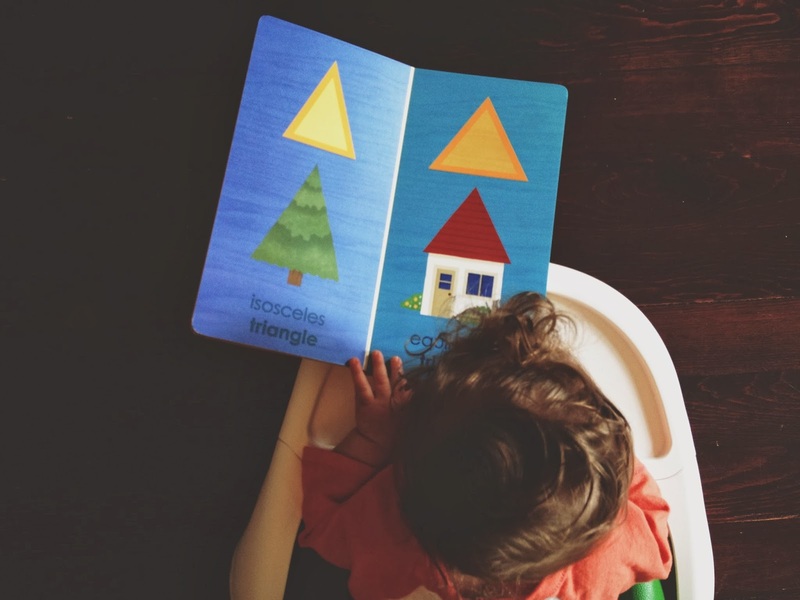 What makes this book more special than other shape books is the fact that it contains die-cut shapes for children to trace with their fingers, thus working towards imprinting the shapes in the "kinesthetic" or "muscular memory" of the child. 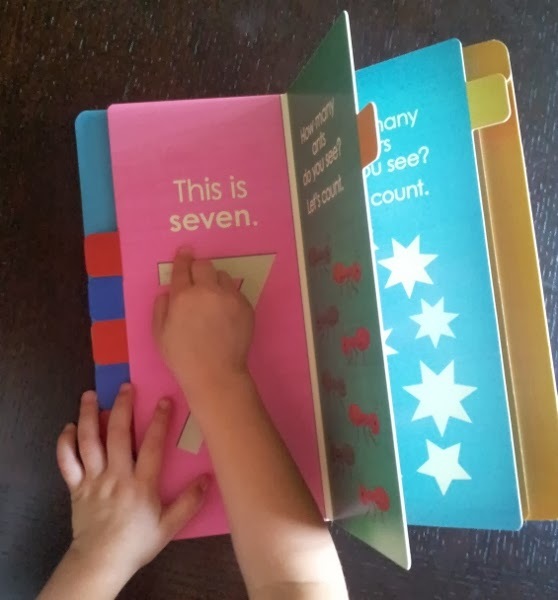 Like all of the three books in this Montessori series, the number book is also a board book meant to stimulate the child's learning through visual and tactile senses. 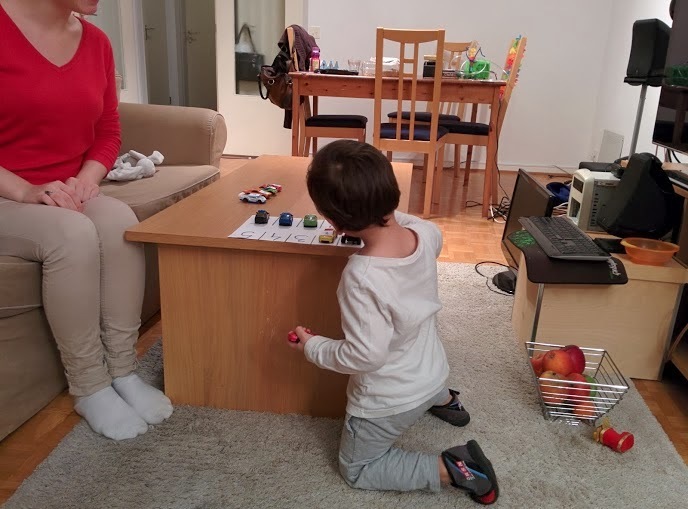 Accompanied by an adult, the hearing sense comes to help as well, as children discriminate the sounds used for each of the symbols that represent the numbers. Similar to the other books, the first page hosts a Parent Letter, during which the method used is explained. 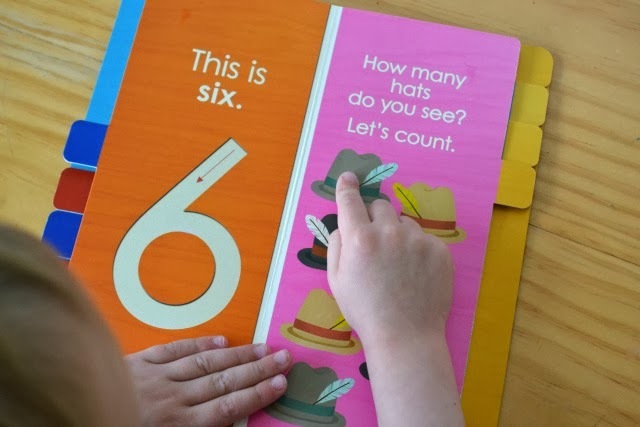 Again, the book is accompanied by real life objects to count, numbers to trace, and the corresponding number rod! Number rods is the first of a series of brilliantly designed mathematical instruments that Montessori created with the purpose of teaching children numeracy and arithmetic. 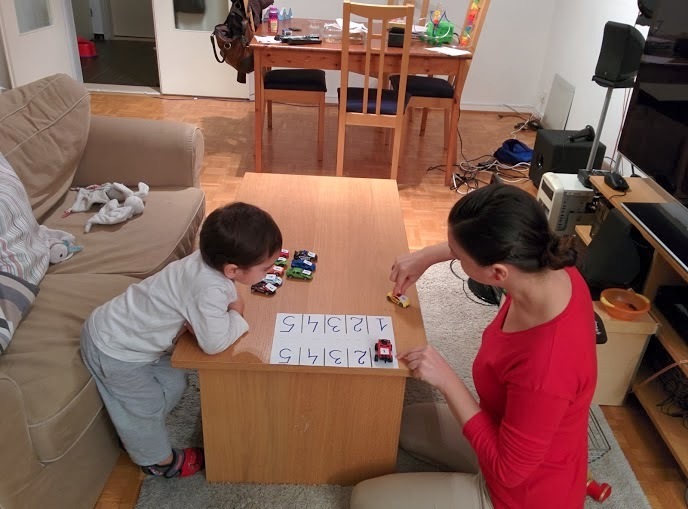 As the child counts through the objects, s/he begins to make the correlation between the quantity, symbol, touch of the symbol and sound, and ultimately the corresponding number rod. 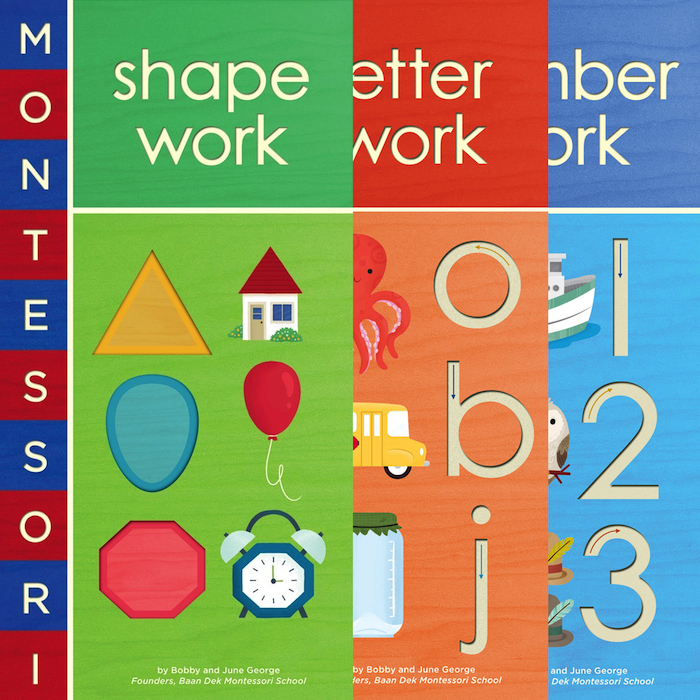 The last book of the series is simply called Montessori: Letter Work and it builds up on the skills gained in the two previous books. 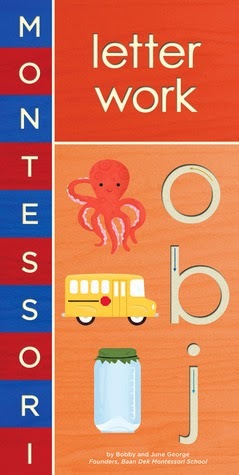 I really love these books because they conveniently have some of the attributes of the Montessori materials packed in elegant, practical, simple board books that respect some of the Montessori principles and help the child make connections between concrete and abstract with the help of their senses. These books are an excellent tool for home or classroom learning. 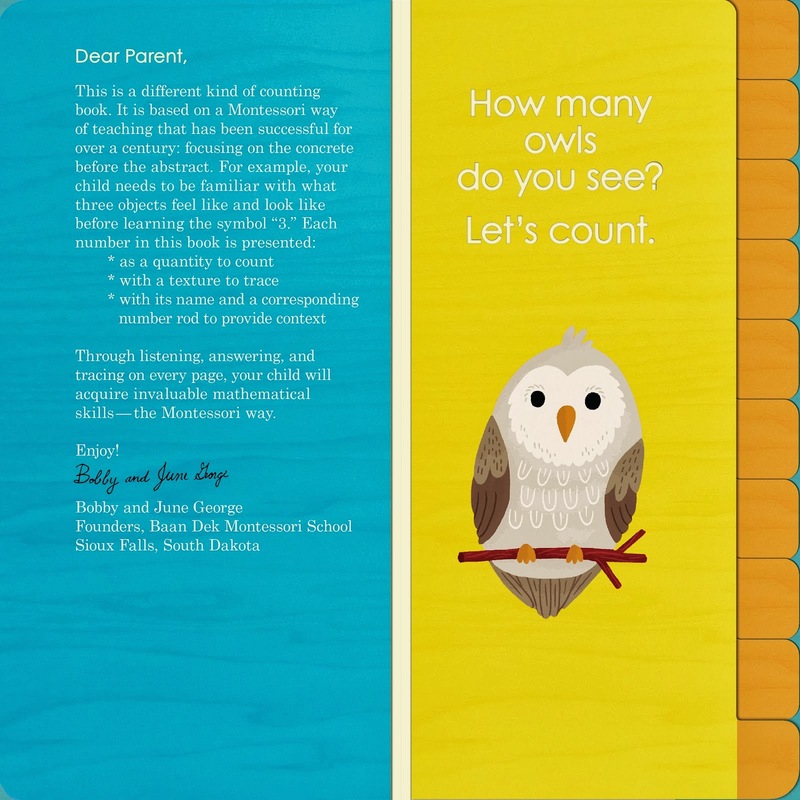 I hope they make you at least a bit curious about Montessori and her method! Feel free to contact me at alexandra.asofie@gmail.com for any questions you may have related to that! I am happy to share my knowledge with any education enthusiast! The winter celebrations are a perfect time for the child to connect with the family and develop certain skills at home, where s/he feels safe, surrounded by love and in charge of the environment. Most of the times, between visits and attending guests or preparing traditional meals, parents have little time to prepare "special" activities for children but the fact is they don't really need to. There are different ways to involve children in all the usual activities, thus facilitating growth. 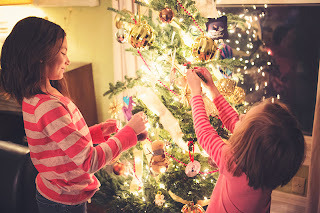 a tree decorated only with crafts made by the family members? If you have a smaller child, did u show him/her the smell of the tree? let him/her touch it? Did you buy special unbreakable child-proof decoration items so that the little ones may enjoy touching and playing with them? For smaller children, try sticking or drawing some numbers on the balls. When you undo the tree, try to find 1, then 2 then 3 and place them in boxes in the correct order. 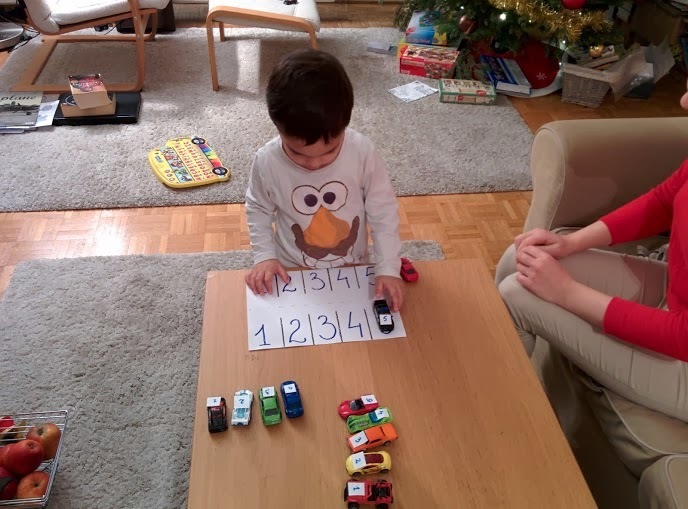 For older children, you can make this a bit more challenging by adding operations such as 45-44 instead of 1, 2X1 instead of two, etc. If your child could use more work on literacy try pasting the alphabet letters, or certain rimes or riddles to stimulate reading or imagination. provide a good self evaluation opportunity for children. Self awareness is one of the most important abilities successful adults have, and sadly enough this competency is not particularly fostered in traditional educational systems where the teacher does all the evaluation. 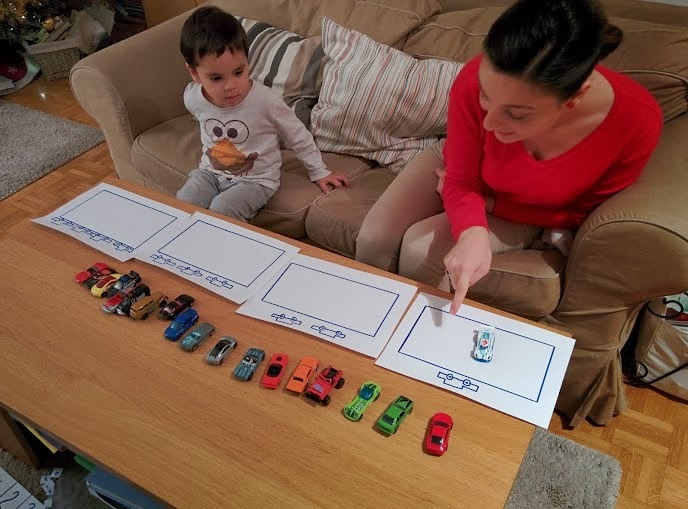 Print images with positive and negative behaviors for your children that they could cut and paste according to whether they behaved like that or not. Have them reflect upon their actions and include their work in their letter to Santa! If they meet Santa at nursery or at home, try to prepare them for the meeting. Meeting Santa is meeting an adult of importance and if they haven't been exposed to different adults they will feel shy and overwhelmed with emotions. Try to familiarize them with what is going to happen during the meeting, with details about Santa and his life :). Once they feel comfortable with that, the encounter may get as educational as possible. Santa can ask or tell about geography, history, different cultures, etc. 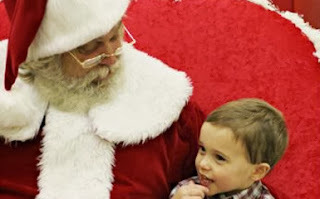 Once children feel comfortable with him, they might be very receptive to whatever Santa has to say! stressed, you might want to do all the things yourself and children in the kitchen might get into the way. You can, however think of how they can help you and how much their involvement means for them! 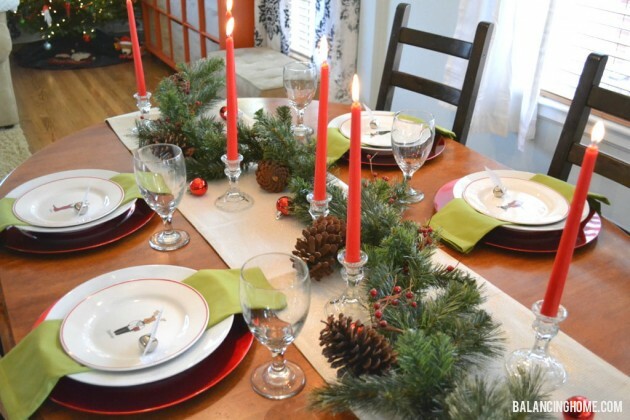 A simple task such as setting the table can help children develop their self esteem, their spatial awareness, fine motor skills, creativity and social skills. Preparing the food can be a right moment to talk about where each food comes from and how, or about the tradition of each meal. This enhances the child's knowledge about the world and gives him/her the feeling of belonging to a certain culture, and the developing sense of self confidence. schools where children have to perform in front of an audience full of strangers, where they have to learn some things that they did not contribute to but were assigned to them by their teacher. This alone makes the subject of a different post. 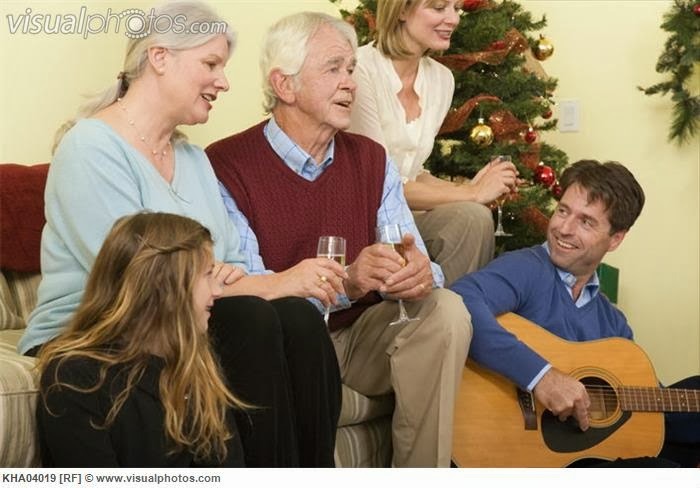 One way of making this easier and more pleasant for Children is to actually sing at home, with the family and in front of people they feel comfortable with. If you are not religious it does not have to be carols but winter songs. 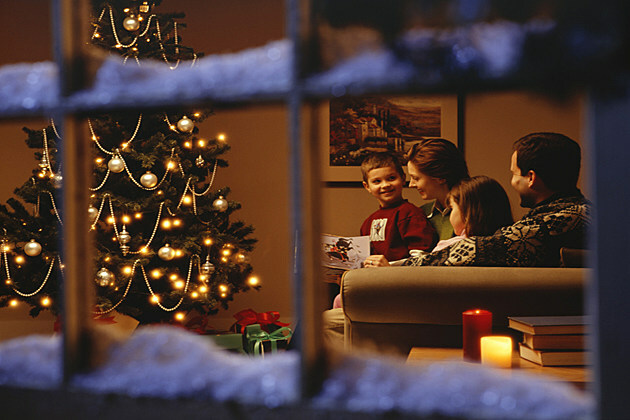 These warm moments bring the family together and create wonderful memories for the little ones. They also empower them to feel comfortable to give a performance when time comes :). 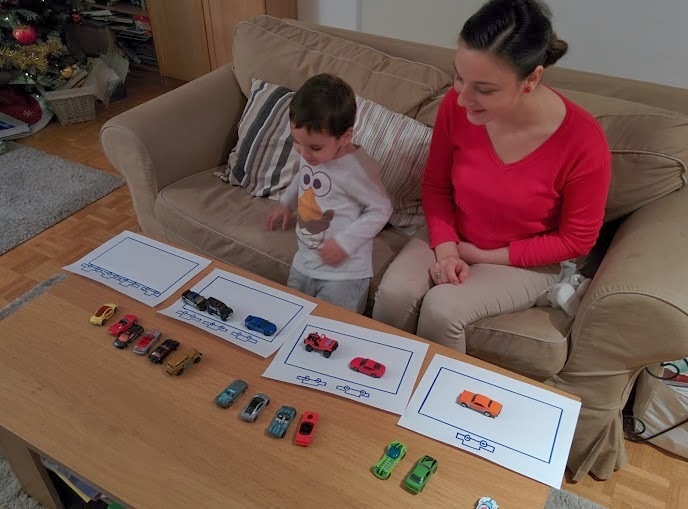 moment each year until children grow when everyone thinks of what they wish to do in the future year in different roles is teaching your child another very useful skill for his/her future adulthood: that of planning ahead! 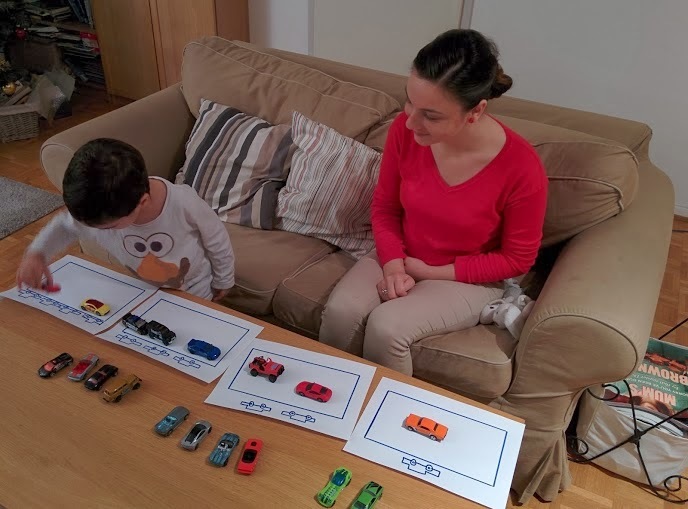 It is common knowledge that planned things are more likely to occur, so this simple gesture is of great significance for your child's future life. Have them draw pictures of how they wish their future year to be, paint or write wishes or compositions! They will exercise more skills at once and eventually understand the importance of planning! 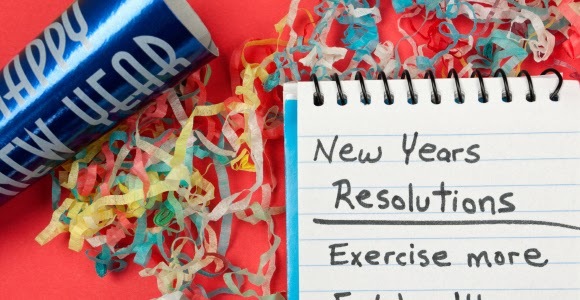 And doing this with all the members of the family enhances accountability and mutual understanding and increases the chances of everyone helping each other to succeed with their resolutions! There are many other things to do around Christmas time: reading and story telling, guessing different Christmassy smells, or doing lots of sporty outdoor activities. Most of the times, in what concerns very busy parents just being all together, playing some board games or giving and receiving presents can be everything the little ones wish for.. I hope this post inspired you and that you all have the best holidays and the most magical family time! How to make School Rock! When I was in London for a workshop, one of the trainers passionately spoke about this project she heard about some time ago. It was designed and implemented by a team of unconventional educators in Belgium and it seems to have been a great success in the country. They decided to go to schools around Belgium and have one week of school built around the theme of rocks! They first tried it on a class where, Monday morning they brought in class and placed on the teacher's desk a large impressive collection of rocks of all types and sizes. The children gathered around them, and explored them curiously. Some of them were not really interested, but some of them began touching and moving them. They were curious of how they tasted or what sounds they make when bashed against each other. Shortly after they began to classify them in groups of different sizes and colors. The second day, children found around the rocks various books on rocks and minerals. While some children were quite uninterested, others began to explore by themselves and identify each type of rock and understand their formation. They shared the information in class and at home. 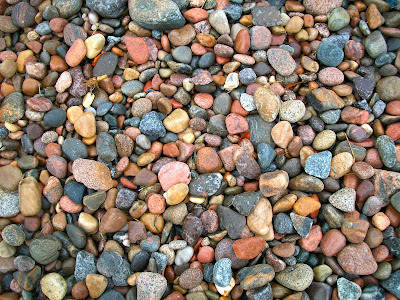 The sudden apparition of rocks made a lot of buzz in the lives of those children. 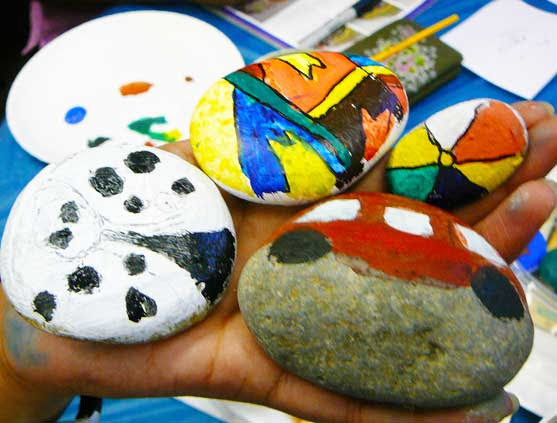 They began to be more curious and so the question "What can we do with all these rocks?" quickly appeared into their minds. They started to make patterns out of them, to build towers, to build bunkers, alleys and even portraits. The following days, different types of weighting scales were found around the classroom. Children began to use them and see how much different rocks weighted. They compared the weights of similar sized rocks and used several scales to weight single rocks. Some children began recording the results. One child was wondering how many feathers would take to equalize the weight of the smallest rock. The teacher brought feathers so the children happily followed up on the idea. The last days of the project, instead of scales, the children found paint and brushes. They took on to painting the rocks. Some of them painted two or three, but others spent their whole day painting one after another. Lots of creative patterns emerged, inspired by nature or their day to day lives. And so after one week of fun and exploration, practical and theoretical learning, they ended their Rock Project. They learned about the types of rocks and their formation. About concepts such as weight, mass or gravity; they found out about different types of scales and how to use them. They read. They learned where and how to search for information. They followed up on their interests and curiosities. They worked individually or in groups, spontaneously, without adult intervention. Like real scientists they began to record their results. They expressed themselves in a creative manner with quite inexpensive materials. 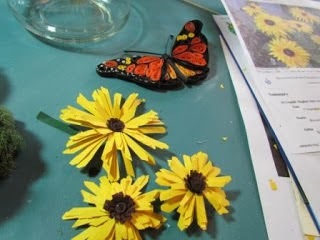 I also liked the fact that the adults guided them sensitively and only thought of what materials to introduce and when. They did not come with a preset agenda for the children, but rather responded to their interests. I think that made learning more powerful. There is a large number of creative activities that can be done on this theme to cover all areas of development. I really like how the children in D Y Patil International School in Belgium used one of Belgium's most plentiful resources - chocolate :) - to recognize and create sedimentary, metamorphic and igneous rocks! You can find the pictures from their science experiment here. 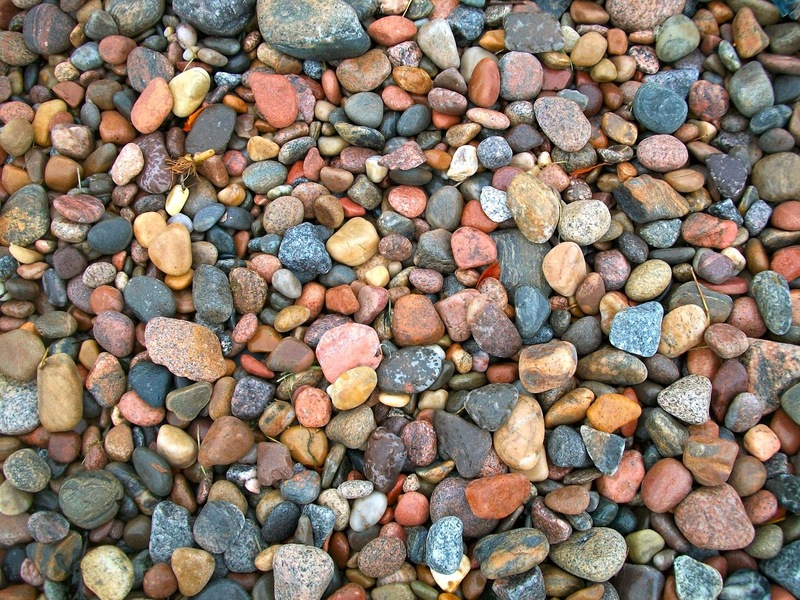 Another resource you might find useful if you would like to take on such a project is this website http://www.rocksforkids.com/, which contains lots of useful information and pictures on rocks, minerals and fossils! Thank you for reading and either you are a teacher, parent or an education enthusiast, good luck with creating the most exciting, stimulating learning environments! Anthony Browne is an amazing British artist! I really love both his illustrations and his stories. The stories are original, profound and insightful and deal with different facets of childhood. His illustrations are brilliant! They are often full of hidden meanings which children can discover gradually. Browne uses different characters from famous classical paintings to educate children on the history of art or to express certain feelings in an unconventional way. He also uses gorillas as characters, being inspired by real stories and the contrast between their strength and their humanity and gentleness. Silly Billy is a book that can help children deal with anxiety and some of the fears they face when they go to bed. Browne leaves nothing to chance. 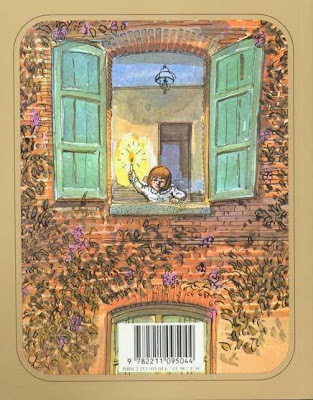 If you carefully analyze the cover you will see something that looks like a doll, with a sad face, and a boy walking towards the future with a happy face. These two clues make you curious from the start to discover Billy's story and why he's called silly in the title. From the very fist pages we find out Billy was a boy who would worry about a lot of things. Not to give children ideas of real things to worry about, the author had Billy worry about hats and shoes, clouds and rain and giant birds, fears that are not at all common among children. The use of black and white for the illustrations of Billy's fears are very compelling. Browne also makes references to the work of Magritte by using his style of drawing the hats. Of course his parents tried to talk to him, and reassure him they are there to protect him. But for Billy this was not enough. One night, he had to sleep at his grandmother's house. He got particularly worried when he slept in other places, and and his anxiety grew, he felt a bit ridiculous and went into his grandma's room. His grandma reassured him that he wasn't silly at all! She then came with a solution for his worries, some worry dolls for him to tell all his worry to, and put them under his pillow. They would take his worries for him, and he could sleep in peace. Billy tried the worrying dolls and for three days he slept very well. But soon, Billy got worried again! He felt bad for the worry dolls, to carry all the weight of his worries for him, so he decided do to some crafty work and make some worry dolls for his worry dolls! And that was the end of Billy's worries. At the end of the book we get a short explanation. These worry dolls actually come from Guatemala, where children would make them from wood, colorful pieces of cloth and thread. They have proven to be quite useful for children, and today they are even used in certain hospitals to help children deal with their fears. 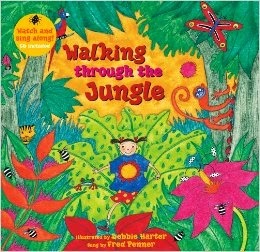 Many teachers accompany this books with discussions about fears or with practical activities. The dolls are easy to make. Here is an example of a doll making activity inspired by the book. Another example of activity is this animation made by the children of Columbia Primary School for the London's Children Film Festival (2009). You can find many articles and interviews with Anthony Browne on the internet. Here is a series of 6 clips from a conference where he spoke about his inspiration and the stories behind his books and illustrations! For the second book I choose one a little bit easier and with no negative emotional charge. Philippe Dumas's story is perfect for a warm, cosy, full of fantasy bedtime read. The book has a witty start as the author presents the two main characters: a boy and a girl who broke anything and never spoke bad words. The little readers are reassured as they flip the page and discover the boy and the girl were two plastic dolls! The owner of the dolls, a little giant girl, was happy to play and sleep with them. 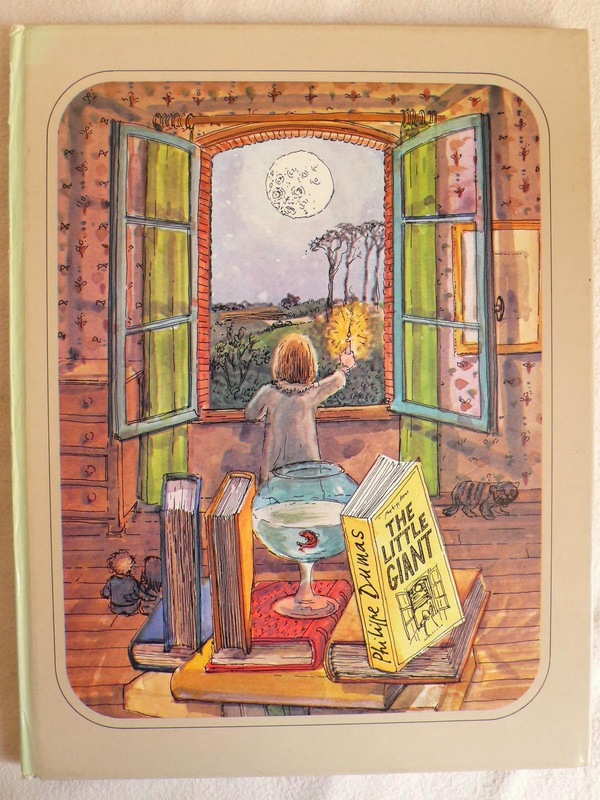 During the day, she was a giant, but at night, she would lessen into their size and they would tip toe out of their room and eventually out of the house. They would travel on the dog and roam the fields at night. Run through the wind, watch the stars, the animals of the night, the sounds of the nature. They would swim with the ducks and make fire for the butterflies. They would then stop at the rabbits den, where they would be awaited with tea or warm onion soup, listen to stories, then sit on trees with the crows and pass by the cows in the field on their way back. As the night grew shorter they would hurry back home. The little girl would regain her normal size. And as soon as they jumped back into bed the morning light would come trough the window, and together with it, the biggest giants would come into the room to say good morning! For me this story is more than just a simple tale. With the help of beautiful, colored illustrations, it proposes an exercise of imagination, empathy and a lesson for both children and adults on how the world is scaled and the magic of childhood. As a montessorian, this book is perfect not only for children but for all the adults who yet need to understand the relevance of child sized environments for their children's proper development! 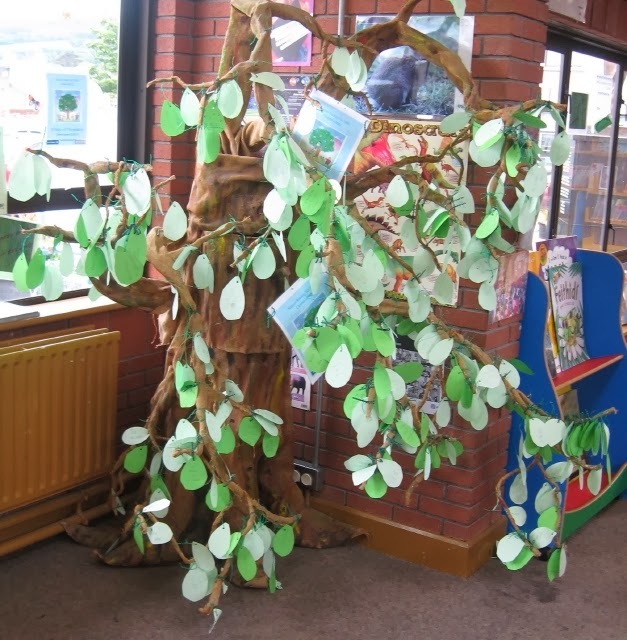 Have you ever heard of a Reading Tree? I myself often enjoy reading in the park under certain trees, but this concept is something a bit different. It is related to literacy in class and it encourages one of the healthiest intellectual activities for children with the involvement of the whole community of children, including their parents! It helps children develop their reading skills thus enhancing their vocabulary and understanding of the world, it allows a whole class to work for a common goal and it also creates some understanding around biology concepts around the tree as a living habitat. Teachers build a real size tree (trunk and branches) and place it somewhere in the classroom. 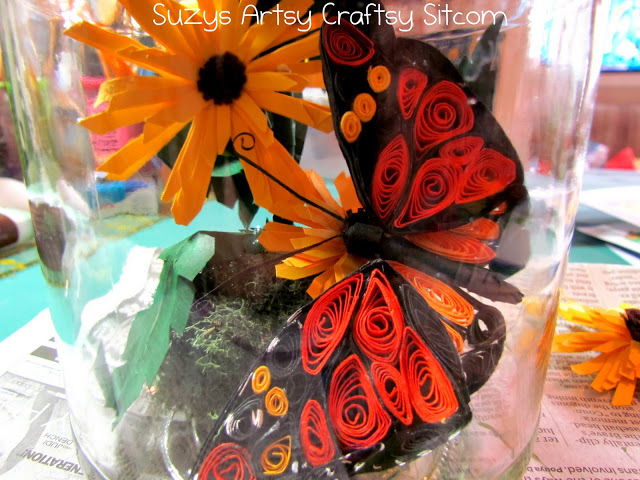 Teachers then build different types of crafts on categories: for ex. : leafs for level 1, flowers for level 2, apples or other fruits for level 3, caterpillars for level 4, chrysalis for level 5 and butterflies for level 6. For these two steps the help of an artist should be more than welcome. Perhaps you have one in your parents community? Each child should write down the titles of the book/s they read, the pages or hours spent reading and any other comments. The parents should then put a signature there as well, not so much to confirm what the child wrote but to show they are also aware of the child's efforts and that they also support and encourage the child at home. 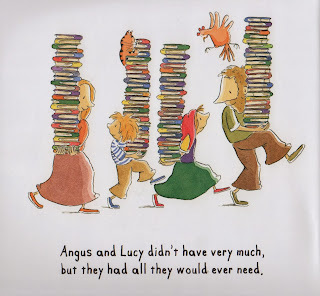 Teacher and parents should, for example provide a NON MANDATORY reading list, for different levels of reading, which the children could use for choosing their books. They could be group by themes or by the different concepts they will learn at school for each subject throughout the year. Children should be free to choose whichever books are appropriate for their age, following their interests and curiosities. This projects also offers children a good opportunity to learn about the School Library or the County Library. 4. Different levels are then established. For example a child reaches level 1 after completing one hour of reading or 20 pages. For level 2, two or three hours or the equivalent in pages, and so on. Once the child has completed a certain level, s/he brings the completed reading card to the teacher. The teacher then gives him/her the correspondent craft for the level s/he completed, which the child will then hang in the Reading Tree, with a little paper note attached with his/her name on it and date. Special "seasonal" crafts can be created for Easter, Christmas, Summer or Autumn. 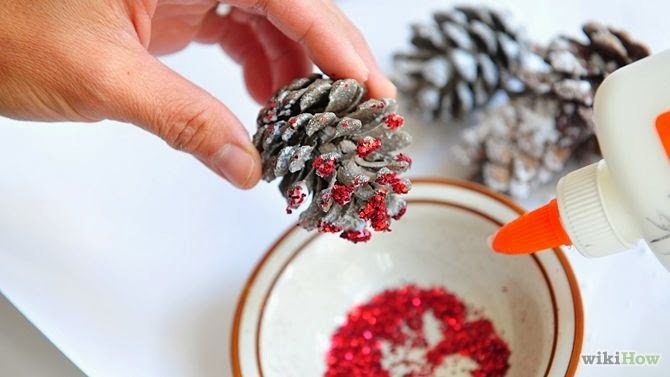 Should someone reach level 6 before the year is finished, then other levels can be created, with crafts such as cones, bird nests, birds or bees. 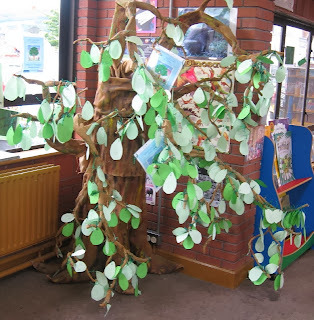 The theme of the tree should be respected, as it is a wonderful opportunity for children to refresh biology concepts such as species of trees and correspondent leafs, life cycles, tree mini beasts, birds or the tree as a habitat. 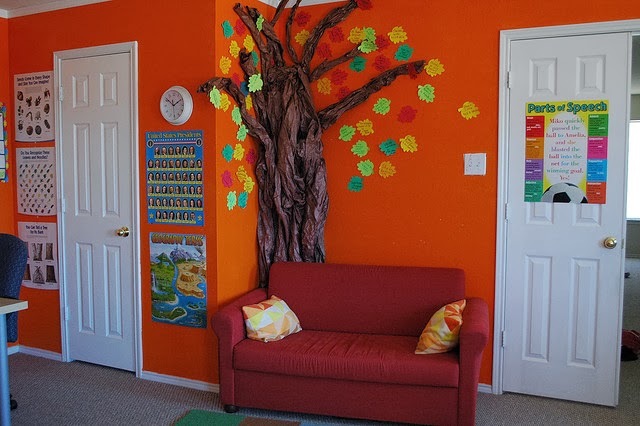 Something else that can be done to support reading through this project is to create a Reading Cosy Corner under the tree, by adding a couch or bench with pillows. On the nearest walls you could put some shelves and children could bring at school some of their favorite books to share with colleagues. These books could be browsed during breaks or during language classes. The teacher/s could build activities around it to keep it active and the children engaged. 5. At the end of the school year, the Reading Tree should be filled with life, and lots of colored, beautiful proofs of the children's work to build themselves as individuals and community. Since all the crafts will be named and dated, they can be taken home and kept in the family archive :). I have discovered this project working with two wonderful children who participate in it at school at the International German School of Brussels. I hope it will inspire parents and teachers to build many more stimulating learning environments all around the world! Enjoy your reading everyone!